I urge your support of Bill 79. This bill is historic. It’s an opportunity to make a pro-active choice for the future direction of agriculture on Hawaii Island. The choice of Bill 79 is clear. To support Bill 79 is to prohibit future GMO food crops and big agrochemical corporate interests from controlling and dominating agriculture in our county. It is supporting a policy of aloha ‘aina. It opens up possibilities for Hawaii County to prosper as a GMO-free food crop area, with the exception of GMO papayas To oppose Bill 79 is to choose to stand with monopoly corporate interests –Monsanto, Dow, Syngenta, etc. who put short term profits and control of the world’s seed supply before concerns of people’s health and safety and the life of the land. These mammoth corporations simply view Hawaii’s land as a commodity to be exploited for their personal gain. If and when there are irreparable unintended consequences, they will cut and run, taking their profits and leaving Hawaii’s people and land with their mess.To ban GMOs is to make a choice for the precautionary principle. It’s the right thing to do for people, plants and animals, for the land, for the water, for the air, for the earth itself. Climate change, global warming, the epidemics of cancer, etc. are all testimonies that we have failed in the past to take to heart and practice the precautionary principle. We are on borrowed time. Let us not make the same mistakes again. Support Bill 79. Ban GMOs. It’s the pono thing to do. Stand up to the Obama Warfare and Surveillance State! 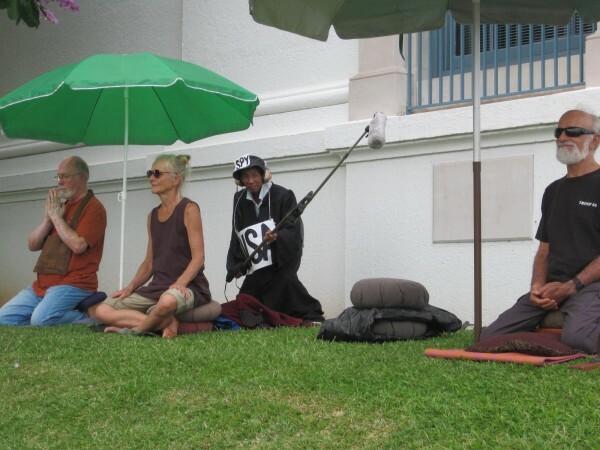 This Friday (June 28th) Hilo peace vigil is extra important. 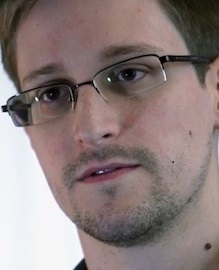 The focus with be in support of Whistleblower Ed Snowden exposing the vast U.S. Surveillance state. We will have signs that say “Stand with Whistleblower Edward Snowden.” and we’ll have Ed Snowden masks. We’ll also have an NSA spy costume with extended microphone for some sidewalk surveillance drama. 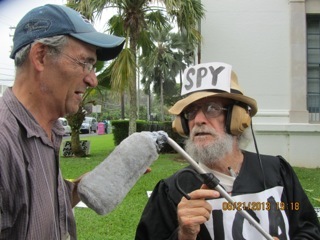 NSA spy volunteer actors welcome. Please pass the word and make an extra effort to join this week’s vigil. Stand up to support Snowden, to dismantle the surveillance/warfare state, and say No to war on Syria. Mahalo. The U.S. Government, and its media mouthpieces, do not want to focus on the content of CIA and NSA Whistleblower Edward Snowden’s exposures because they reveal a secret, massive, systematic, industrial-scale surveillance state. Ask who is the real danger, Snowden for exposing it, or the U.S. Military/Industrial Complex for creating it? Snowden believed what he saw violated basic human rights and privacy and therefore in the public interest, he disclosed the information and performed an invaluable public service at great personal risk. He deserves our gratitude as do Wikileaks founder, Julian Assange, and Marine Bradley Manning for disclosing U.S. war crimes. has failed to shut down the shameful U.S. prison at Guantanamo or release prisoners even after they have been exonerated. The secret, massive surveillance state disclosed by Snowden is in itself, a disgrace to the rule of law. The one thing the Obama administration has continued to prosecute are illegal wars of aggression and occupation. Syria and Iran are next on the chopping block. Obama has increased the use of Reaper and Predator drones that have killed a countless number of children and other innocent people, violated other countries sovereignty, and has increased hatred toward the U.S. around the world. The U.S. National Security Administration (NSA) has been conducting a massive phone call and internet surveillance dragnet of U.S. citizens and others which the American Civil Liberties Union (ACLU) calls an abuse of statutory power and a violation of basic 1st and 4th amendment rights. We owe our thanks to former NSA contractor Edward Snowden and Guardian reporter Glenn Greenwald for making this criminal activity public.